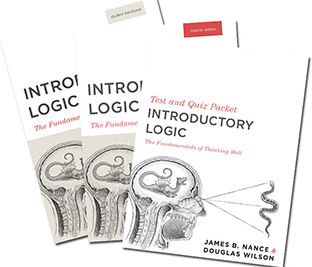 Our best selling logic books. Produced by the Bluedorn family - a great introduction to logic. Logic is the art of reasoning well—of learning to think God's thoughts after Him. In this book, directed toward junior-high students, Douglas Wilson and James Nance lay the proper foundation of reasoning in the truth of God, and go on to train students in the crucial skills of defining terms, recognizing basic types of statements, arguing with syllogisms, arguing in ordinary language, and identifying informal fallacies. Do you think Logic is a dry, boring subject? It's not! Not when Fred teaches it. What other math book has a chapter titled "Stinky Logic?" This book doesn't have bothersome "problems" or strenuous "exercises." It has delightful "puzzles," instead. It has serious mathematical Logic, from the basics to advanced topics.